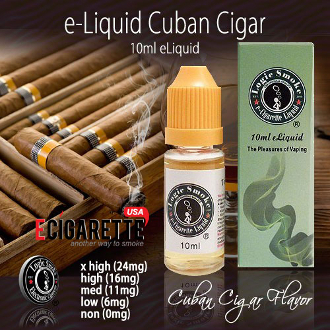 Anyone who enjoys a good Cuban cigar will love our electronic cigarette juice cuban cigar flavor. It is a bold and aromatic flavor that tastes just like the original Cuban Cigar. Cigar aficionados around the world have sworn this flavor is top notch. Buy a bottle today and add this wonderful flavor to your e juice collection.